Wearing comfortable shoes that fit well can prevent many foot ailments. Foot width may increase with age. Always have your feet measured before buying shoes. The upper part of the shoes should be made of a soft, flexible material to match the shape of your foot. Shoes made of leather can reduce the possibility of skin irritations. Soles should provide solid footing and not be slippery. Thick soles lessen pressure when walking on hard surfaces. Low-heeled shoes are more comfortable, safer, and less damaging than high-heeled shoes. Fungal and bacterial conditions -- including athlete's foot -- occur because the feet are usually enclosed in a dark, damp, warm environment. These infections cause redness, blisters, peeling, and itching. If not treated promptly, an infection may become chronic and difficult to cure. 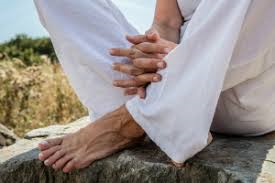 To prevent these conditions, keep the feet -- especially the area between the toes -- clean and dry and expose the feet to air whenever possible. If you are prone to fungal infections, you may want to dust your feet daily with a fungicidal powder. Dry skin can cause itching and burning feet. Use a mild soap sparingly and a body lotion on your legs and feet every day. The best moisturizers contain petroleum jelly or lanolin. Be cautious about adding oils to bath water since they can make the feet and bathtub very slippery. Corns and calluses are caused by the friction and pressure of bony areas rubbing against shoes. A podiatrist or a physician can determine the cause of this condition and can suggest treatment, which may include getting better-fitting shoes or special pads. Over-the-counter medicines contain acids that destroy the tissue but do not treat the cause. These medicines can sometimes reduce the need for surgery. Treating corns or calluses yourself may be harmful, especially if you have diabetes or poor circulation. Warts are skin growths caused by viruses. They are sometimes painful and if untreated, may spread. Since over-the-counter preparations rarely cure warts, get professional care. A doctor can apply for medicines, burn or freeze the wart off, or remove the wart surgically. Bunions develop when big toe joints are out of line and become swollen and tender. Bunions may be caused by poor-fitting shoes that press on a deformity or an inherited weakness in the foot. If a bunion is not severe, wearing shoes cut wide at the instep and toes may provide relief. Protective pads can also cushion the painful area. Bunions can be treated by applying or injecting certain drugs, using whirlpool baths, or sometimes having surgery. Ingrown toenails occur when a piece of the nail breaks the skin. This is usually caused by improperly trimmed nails. Ingrown toenails are especially common in the large toes. A podiatrist or doctor can remove the part of the nail that is cutting into the skin. This will allow the area to heal. Ingrown toenails can usually be avoided by cutting the toenail straight across and level with the top of the toe. Hammertoe is caused by shortening the tendons that control the movements. The toe knuckle is usually enlarged, drawing the toe back. Over time, the joint enlarges and stiffens as it rubs against shoes. Your balance may be affected. Hammertoe is treated by wearing shoes and stockings with plenty of toe room. In advanced cases, surgery may be recommended. Spurs are calcium growths that develop on bones of the feet. They are caused by muscle strain in the feet and are irritated by standing for long periods of time, wearing badly fitting shoes, or being overweight. Sometimes they are completely painless, but at other times the pain can be severe. Treatments for spurs include using proper foot support, heel pads, heel cups, or other recommendations by a podiatrist or surgeon. The Administration on Aging of The United States Department of Health and Human Services. AOA Age Page: Foot Care. Last updated March 11, 1999. (Online) www.aoa.dhhs.gov/aoa/pages/agepages/footcare.html"